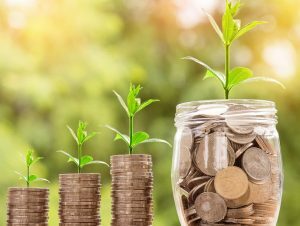 A report released today by GTM Research forecasts $12.5 billion in microgrid investment within the United States over the next six years. “U.S. 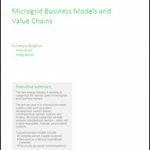 Microgrids 2017: Market Drivers, Analysis and Forecast” identifies 3.2 GW of existing microgrid capacity growing to 6.5 GW by 2022, a 14.1 percent compound annual growth rate. The report shows a significant leap from earlier GTM forecasts largely because the research firm broadened its definition of microgrids, reflecting a move within the industry away from the narrower Department of Energy definition. GTM’s new definition encompasses what it describes as “basic microgrids,” which have only one distributed energy resource (DER) and may serve a single building. In contrast, advanced microgrids – in keeping with the DOE definition – use multiple DERs. Whether basic or advanced, microgrids are distinguished by their ability to provide both “power and energy services when in grid-connected or island mode and be able to island for at least 24 hours,” said GTM, in announcing the new report. Microgrids offered by firms like Enchanted Rock (Erock) and PowerSecure exemplify the basic microgrid, said Colleen Metelitsa, GTM analyst and report author, in an interview. The value of this “hidden microgrid market” became apparent when these simpler installations kept the power flowing in the South during recent hurricanes. 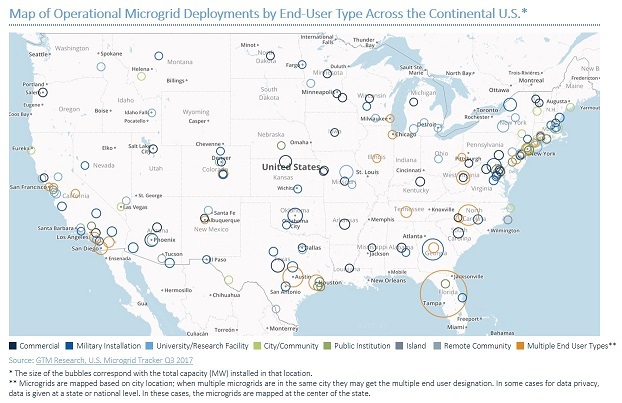 Basic microgrids, which makes up 58 percent of microgrid capacity, appeal to customers who only want resiliency and “don’t want to deal with the regulatory headaches” or long time-frame that might accompany development of advanced microgrids, she said. Conversely, advanced microgrids can offer more benefits, such a diverse fuel and technology mix with greater opportunity for arbitrage and resource management. 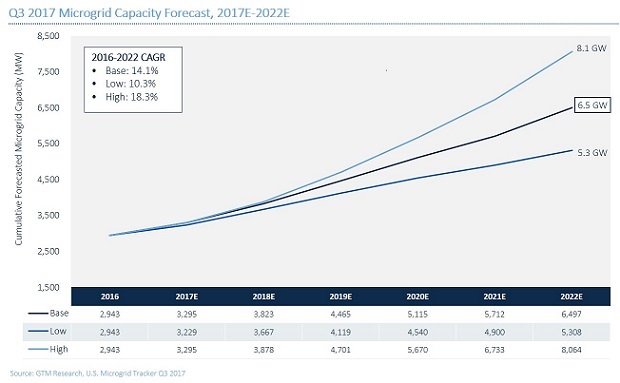 The report forecasts that the annual microgrid market opportunity will double over the next five years from $1.4 billion in 2017 to $2.8 billion in 2022. The growth follows a dip in microgrid installations in 2017. Only 352 MW of microgrid capacity was installed in 2017, compared with 451 MW in 2016. Metelitsa said the 2017 numbers may reflect the fact that small energy markets can be skewed heavily up or down by the timing of just a few large projects. For example, the military brought fewer projects online this year, a reflection not of its commitment to microgrids, but more likely of scheduling. “They deployed over 200 MW last year, half the market. This year they deployed less than 50 MW. I don’t think the military has hit its saturation point, but I think they got a lot of projects through last year and more are in the pipeline,” she said. Further, she noted that growth often is not linear for early energy markets, like microgrids. “There are these moments in time that create a lot of interest in microgrids and lead to adoption and development and then it can back off a little bit,” she said. This fall’s round of North American storms – particularly the collapse of Puerto Rico’s electric grid following Hurricane Maria – again piqued interest in microgrid investment. Because projects are highly customized and technology costs are dropping, it is difficult to define standard costs. Compounding the problem is a reticence by private developers to divulge project financials. As a result, Metelitsa relied heavily on publicly available data from government-backed microgrids. The GTM figures represent median costs, minus outlier microgrids, such as the Philadelphia Navy Yard project – a highly sophisticated project that would skew the figures into unrealistic ranges. She advises that potential microgrid customers use the cost figures in the report as a guideline or range that serves as a “gut check” when they consider projects. Per kilowatt costs may be higher or lower depending on the customer’s requirements and priorities, she said. “What technology types am I including? Is it a complex system? Are there multiple buildings? Do I want a really advanced control system, meaning do I want there to be weather forecasting that will tell my system ‘Yes, you should bid into the grid today because it’s nice weather and we don’t expect an outage. Or we expect a storm coming this evening, so don’t bid into the system,’” she said. Microgrid technology companies, such as Siemens, are increasingly accommodating various budgets by offering degrees of microgrid control sophistication, she said. A market game changer may be emerging – the no or low-upfront payment microgrid. Known as microgrid-as-a-service or reliability-as-a-service, variations on the approach are being used by Ameresco, Duke Renewables, ERock, NRG Energy, Schneider Electric and others. The details vary, but generally a third party – not the customer – covers the project’s capital costs in return for certain value streams, possibly achieved by arbitraging the project against grid power, participating in demand response or selling ancillary services. The customer receives back-up power and often fixed or low-cost energy over a long-term. “You’re seeing a lot more companies looking at that. I think it is super important to the growth of the industry. I don’t think the industry is going to continue to grow if the end-users are always the ones paying the upfront costs,” she said. Metelitsa sees more than one market emerging for utilities, depending on state rate decisions and competitive models, namely whether or not the utilities are restructured or vertically integrated. She noted that Arizona Public Service, a vertically integrated utility, has won approval to recover part of its microgrid investment costs through rates, so is likely to develop microgrids. In other states, however, regulators are reticent to approve rate recovery. Meanwhile, in restructured states questions exist about whether or not microgrids are non-wires alternatives or generation. If microgrids are designated as generation, utilities face ownership limitations in restructured states. The utility picture is likely become clearer over the next two to three years as state regulators decide more rate cases that involve microgrids, she said. U.S. states have committed $86 million to microgrid-related technology innovation and early-stage project development and $189 million to microgrid construction over the last five years. Track news about microgrid investment and forecasts. Subscribe to the free Microgrid Knowledge newsletter. Good article, ABB is the largest MicroGrid provider in the US, far outpacing both Siemens and Schneider Electric, the market is heavily slanted toward the Medium Voltage Equipment offering, of which ABB has the largest market share.